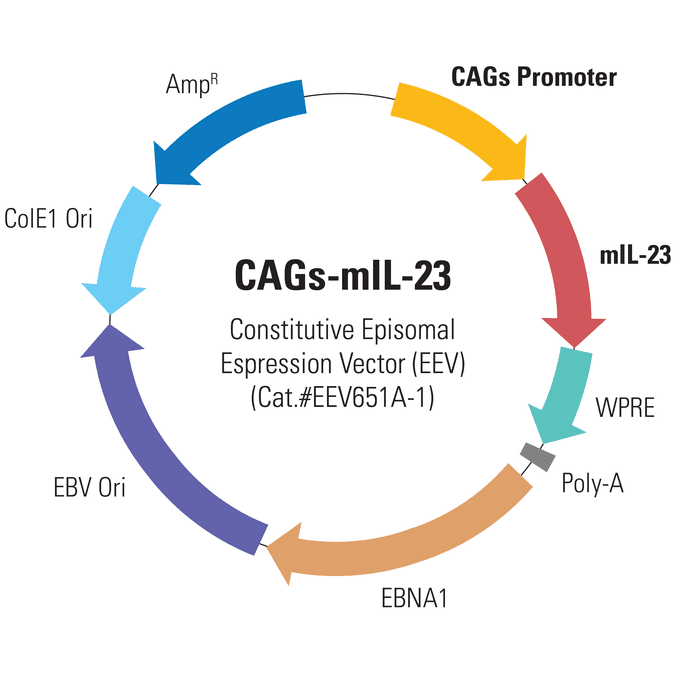 With the CAGs-mIL-23 Enhanced Episomal Vector (EEV), you can get sustained, long-lasting, and non-viral expression of the mouse IL-23 gene from a non-integrating vector. Driven by the constitutive CAG promoter, the CAGs-mIL-23 EEV works in most cell types, including primary cells and stem cells, and can even be directly injected into mice. Figure 1. A constitutive EEV reporter based on CAGs-MCS leads to higher serum IL-23 levels in mice than two other episomal vector systems. We compared SBI’s EEV system to two other episomal vector systems—minicircle technology1 and the mini-intronic plasmid system2—using a mouse IL-23 cDNA cloned into the three different vectors. We introduced the three vectors or vehicle only into mice using hydrodynamic tail vein delivery (HDD). After seven days, we measured serum IL-23 levels using an ELISA assay and found that the EEV technology outperformed the other episomal platforms by at least 10-fold, demonstrating the ability of the EEV platform to provide sustained, long-lasting transgene expression. Kay MA, He CY, and Chen ZY. A robust system for production of minicircle DNA vectors. Nat Biotechnol. 2010 Dec; 28(12):1287-9. PMCID: PMC4144359. Lu J, Zhang F, and Kay MA. A mini-intronic plasmid (MIP): a novel robust transgene expression vector in vivo and in vitro. Mol Ther. 2013 May; 21(5):954-63. PMCID: PMC3666631.